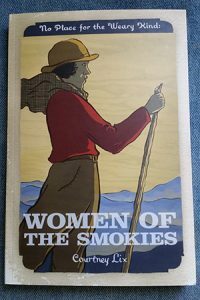 From legendary hiker Margaret Stevenson to famed singer/songwriter Dolly Parton, what do these nineteen remarkable Smoky Mountain women have in common? Tenacity, perseverance, and an ironwood-like toughness in the face of adversity. Besides that, all had (or have) a deep love of the Great Smoky Mountains. Join author Courtney Lix as she celebrates the inspiring stories of these women’s exciting and triumphant lives. Ila Hatter is one of the local naturalist/chefs profiled in “Eating Appalachia, rediscovering regional American flavors” by Darrin Nordahl. This is a look at ten unique foods that are native to the region, including pawpaws, ramps, hickory nuts, American persimmons, and elk; and offers delicious and award-winning recipes for each ingredient, along with sumptuous color photographs. Ila Hatter, a well-loved herbalist and folklorist from the mountains of Western North Carolina, has put together a unique cookbook that pulls together 390 wild food recipes she has collected from southern Appalachian cooks over a 25 year period. From Acorn Quick Bread to Persimmon Pudding, these tasty concoctions will tempt you to get out of the house and make the most of the treasure-trove of wild edibles right outside your back door. Full of how-to tips and tidbits of history on each plant, as well as quotes and folk uses. All the edible plants described here can be found along a backcountry road. Illustrations and identification tips are included. After languishing for 50 years in libraries, archives and attics around the southern Appalachian region, the following manuscript by William Banks was brought to the attention of Great Smoky Mountains Association by two of the organization’s most active members: Jerry Coleman and Ila Hatter. Mr. Coleman and Ms Hatter live near the Cherokee reservation in western North Carolina and are recognized experts on edible and medicinal plants in the area. They were overjoyed to discover the existence of the manuscript and devoted themselves to seeing that it be published.